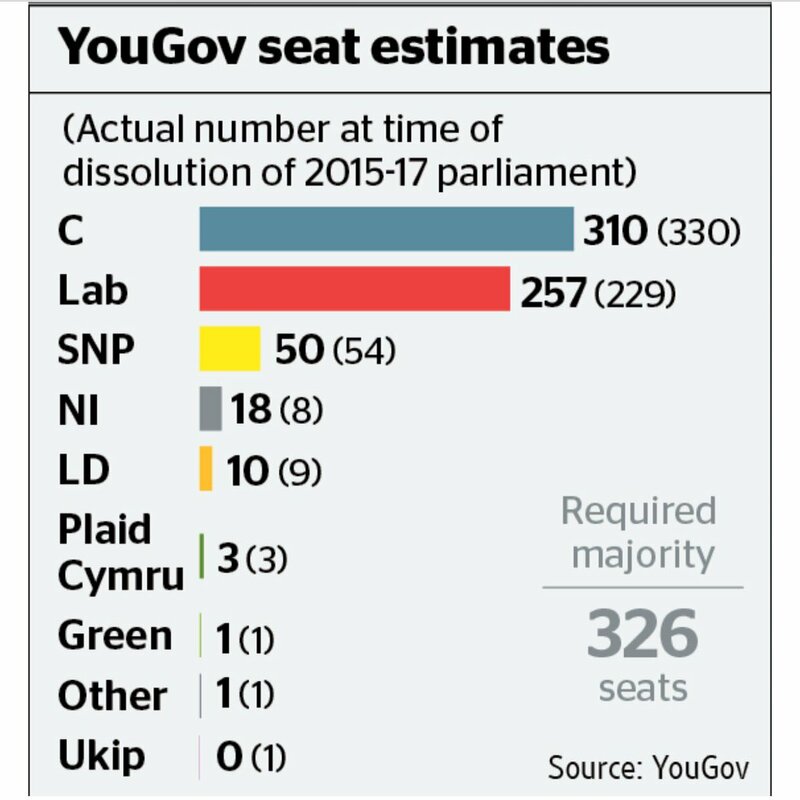 The latest Times/YouGov poll is out and should provide a good bowel-loosening moment or two for the Tories, but I don't believe it. My reading of the situation tells me that Mother May will be returned with a decent majority next week, a view that I have held since the campaign began and which has only strengthened as I watched it unfold. YouGov seems to believe everything that every 18-24 year old tells them about their intention to vote. Alas, I don't, and nor do I believe that the Brexit voting areas of Northern England and the Midlands will suddenly forget the insults that were hurled at them in the months after the Brexit referendum. If Brexit is your main aim in life then a vote for the Tories is the cast-iron way to pretty much guarantee that result. Labour is doing well, there is no question about that. 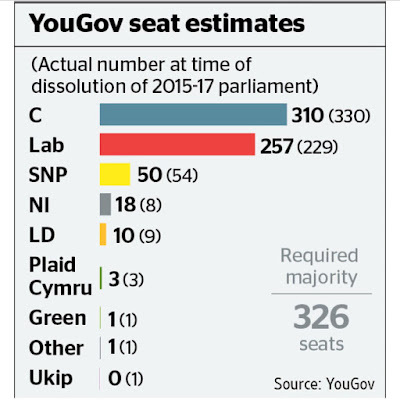 Hopefully, the Tory majority will be around the fifty seat mark, which is a bloody miracle when you consider the fact that some quite serious people thought that Labour was going to self destruct during this campaign. You can understand their point of view, because let's face it, any party that elects a leader who is a teetotal vegetarian who once fucked Dianne Abbott is going to have an electoral mountain to climb that is even more massive than Diane Abbott herself. It is a sign of Labour's growing self-confidence that it can overcome those hurdles and present itself as the alternative party of government. The Liberal-Democrat and Greenie vote has been squeezed down and hopefully will be reduced some more by next week. So, Labour has not only overcome its leader's image problems, it has also managed to demonstrate to all and sundry that it is the only national alternative to the Tories. At the end of the day, if anyone wants the Tories out, then voting Labour is the only way to achieve that aim. I call that a pretty good result, even though it will not be enough to give Labour a victory this time around.